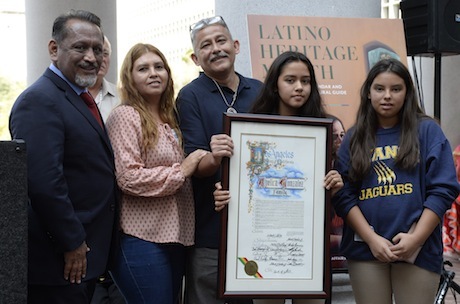 A Southland man arrested by immigration authorities shortly after dropping off one of his daughters at school was honored along with his family Wednesday by the Los Angeles City Council as part of Latino Heritage Month. Romulo Avelica-Gonzalez was detained by federal Immigration and Customs Enforcement agents on Feb. 28 after dropping his daughter off at a Lincoln Heights school. A video of his arrest made by another daughter was widely seen on social media and helped make his case a focal point of advocates critical of President Donald Trump’s aggressive actions on illegal immigration since taking office in January. Avelica-Gonzalez was released from custody on Aug. 30 after the Board of Immigration Appeals dismissed a deportation order against him. His case still needs to be reviewed by an immigration judge to consider if he should be permitted to remain in the United States, where he has lived illegally for 30 years. Supporters of Avelica-Gonzalez, a 49-year-old father of four, said the original deportation order arose from a pair of misdemeanor convictions against him dating back 20 years. Attorneys said those convictions were vacated in June, and he should be permitted to remain in the country. Avelica-Gonzalez’s arrest made national headlines. He had just dropped moff his 12-year-old daughter at school in Lincoln Heights, and a short time later, his 14-year-old daughter — who was in his car — cried as she filmed her father being taken into custody by immigration authorities. “Thank you to all the people who helped me and supported me. Thank you for the help with this case,” Avelica-Gonzalez said. Alan Diamante, Avelica-Gonzalez’s attorney, said that he believes the case will end with his client staying in America. A man who was detained by federal immigration authorities shortly after dropping off one of his daughters at school in Highland Park in February was granted a stay today that will delay his deportation. According to the community groups fighting his deportation, Romulo Avelica-Gonzalez won a stay from the Board of Immigration Appeals, which will review his case. Avelica, a father of four who is in the country illegally but has lived in Los Angeles for nearly 30 years, was facing imminent deportation because an earlier stay issued by a federal appeals court has expired last week. Avelica-Gonzalez’s arrest made national headlines. He had just dropped off his 12-year-old daughter at school, and a short time later, his now 14-year-old daughter — who was in his car — cried as she filmed her father being taken into custody by immigration authorities. Avelica-Gonzalez, 49, remains in custody at the Adelanto Detention Center in San Bernardino County. Avelica-Gonzalez’s supporters said the deportation order against him arose from a pair of misdemeanor charges against him dating back 20 years. Attorneys said they resolved those cases in June, and he should be permitted to remain in the country. Supporters held a rally for him last week in downtown Los Angeles. Among those speaking on his behalf was City Councilman Gil Cedillo. 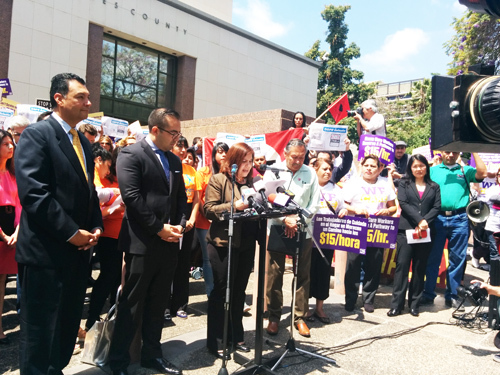 “As he is on the verge of being deported we stand here in unity and solidarity to make it clear to all those who are here, that we will fight for justice, that there cannot be justice until Mr. Romulo is released and returned to his family,” Cedillo said. City Councilman Gil Cedillo Tuesday called for the release of a man who is facing deportation after being picked up by immigration agents while dropping his daughter off at school. Romulo Avelica-Gonzalez was detained by Immigration and Customs Enforcement personnel while dropping off one of his daughters at Academia Avance in Highland Park on Feb. 28. He has lived in the country for 25 years and his case gained widespread attention with the dissemination of video footage taken by another of his daughters, who filmed the incident while sobbing. Cedillo said in June it looked as if Avelica-Gonzalez was going to be released after two prior misdemeanor convictions for receiving stolen property and a DUI were both vacated by a judge. However, Avelica-Gonzalez’ family said Monday that he is still facing deportation and could be transported to Mexico as early as next week. Although Avelica-Gonzalez’s lawyers are trying various legal maneuvers to prevent his detention, an emergency stay of deportation ordered by the U.S. 9th Circuit Court of Appeals expires on Aug. 5. They said Tuesday he could be deported as soon as Aug. 7 if their efforts fail. Local religious leaders and activists said Tuesday they will offer sanctuary to Central American families in the country illegally if President Barack Obama’s administration moves forward with plans to deport them. During a news conference at the Coalition for Humane Immigrant Rights of Los Angeles headquarters, activists vowed to form a “circle of protection” around immigrants, who say their lives would be in danger if they are returned to their native countries. Noel Andersen, a reverend with Church World Service, said he and other clergy officials have been building a “sanctuary movement” to assist Central Americans seeking refuge in the United States. A network of congregations are “preparing themselves as we speak to open their doors for sanctuary if the administration moves forward with their plan,” Andersen said. Raids targeting Central Americans who received deportation orders are set to begin in January, the Washington Post reported. Members of CHIRLA called on President Obama to drop the deportation plans, which have not yet gotten final approval from the Department of Homeland Security. Activists said that El Salvador is likely to have the world’s highest homicide rates this year, due in part to gang violence. Honduras had the highest murder rate, with 90 homicides for every 100,000 residents. Meredith Brown, an immigration attorney, said that volunteer lawyers are ready to help those at risk of being deported. Tuesday was a bittersweet day for East Los Angeles resident Isabel Medina. It was the day she was supposed to become eligible to apply for a program protecting her temporarily from deportation. At a roundtable discussion Tuesday at the county’s Kenneth Hahn Hall of Administration, Medina instead spoke of the disappointment she feels that her dream has been put on hold by a federal judge’s injunction halting President Obama’s executive order on immigration announced last fall, but pledged to continue preparing for the day when she might be able to apply. A coalition of community, faith-based, unions, legal services, civil rights and nonprofit groups participated in the discussion and the press conference following to announce the launch of Ready California, a statewide campaign to help undocumented immigrants like Medina prepare to apply for temporary relief from deportation under programs outlined in the president’s executive order they believe will eventually be implemented. The programs would allow about 5 million of undocumented immigrants in the U.S. to temporarily avoid deportation and receive a work permit good for three years if they meet certain criteria. Texas and 25 other states, however, filed a federal lawsuit to stop the programs, prompting the judge’s injunction halting implementation as the case winds its way through the courts. The application process was originally scheduled to begin Tuesday, May 19. The Ready California initiative will help make sure as many undocumented immigrants living in California as possible are ready to apply when the time comes, said members of the coalition. “We have to facilitate individuals’ ability to prove that they qualify for these programs,” said Angelica Salas, executive director of the Coalition for Humane Immigrant Rights in Los Angeles (CHIRLA) during the roundtable discussion hosted by New American Media before the rally. According to Salas, many of the individuals who qualify for the original DACA, Deferred Action for Childhood Arrivals program or its expansion, which allows people who were brought to the country illegally as children to temporarily avoid deportation, or the new Deferred Action for Parental Accountability, DAPA — which would allow some parents of U.S. born children and permanent residents the same temporary reprieve — also qualify for other existing immigration pathways. Individuals can have their cases reviewed through Ready California and may find they have other options to legalize their immigration status, Salas said. Sally Kinoshita, deputy director for the Immigrant Legal Resource Center, said undocumented immigrants should start working now to gather the documents they will need to apply, such as a Mexican passport, Consular Matriculas and copies of any criminal or misdemeanor court records. According to CHIRLA, Los Angeles County has the highest number of undocumented immigrants: 500,000 with more than 50% from Mexico. Ready California is also working to sign up lenders willing to provide low-interest loans to people who need help paying the $465 application fee. “Our goal is to help change the future of ten thousand families in California,” Diana Cervantes, director of Community Trust Prospera, a division of Self-Help FCU in the San Gabriel Valley told EGP. “Currently, we have $5 million put aside for the loans, but if we can get more through donations we will help more people,” she said. In the meantime, Ready California is working to bring more allies to the table. According to Salas, they need more nonprofit groups and legal service providers to get involved. She estimated in L.A. County alone, at the current participation rate, each legal partner would have to process 5,000 cases a year to meet the demand. At a press conference following the roundtable discussion, Secretary of State Alex Padilla said it’s “not a matter of if, but a matter of when” the president’s programs will take effect. “And for any of the doubters that are out there…for anyone who claims to be for family values — we hear that term all the time in politics — then you have no choice but to be for DACA and DAPA because it’s not just justice to immigrant families but a pivotal point to keep families together,” Padilla said. In California alone, more than 1.35 million undocumented individuals are eligible for the administrative relief programs outlined by the president, according to Ready California. For more information, visit: www.ready-california.org.